Featuring the same HEPA and carbon filters as the popular all-purpose R600, the Airpura UV600 adds a third avenue of defense - an ultraviolet (UV) sterilizer to kill bacteria, viruses, mold spores, and other microorganisms. Ultraviolet lamps produce UV-C light of much greater intensity than sunlight. Almost all of a UV lamp's output is concentrated in the 254 nanometers (nm) region which has been proven to have the greatest germicidal properties of all UV-C wavelengths. The intense UV light penetrates the cell wall of the microorganism and destroys its DNA thereby rendering it incapable of causing illness. UV sterilization is used widely not only in air purification, but also in water treatment. UV sterilization has many advantages over conventional methods of killing microbiological contaminants in that it is extremely effective, chemical free, produces no harmful bi-products, produces limited excess heat, is energy-efficient, is very easy to maintain, and is cost effective to both purchase and maintain. The "U" shaped UV lamp in the Airpura UV600 is roughly double the length of competitor's lamps, allowing for a much higher UV dose. The HEPA filter traps 99.97% of particles 0.3 microns and larger, and roughly 95% of particles down to 0.1 microns, making it ideal for the removal of dust, pet dander, dust mites, pollen, mold spores, and other common particulate contaminants. The carbon filter removes more than 250 common household chemicals, gases, and fumes, as well as organic contaminants that cause bad odors. 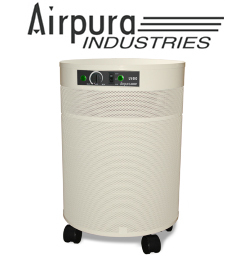 The Airpura UV600 is equipped with a 560 cubic foot per minute variable-speed fan with a one-piece assembly to reduce vibration and noise, felt gaskets to prevent contaminant bypass (many competitors use rubber seals that off-gas VOCs), and an attractive powder-coated steel mesh housing with 360 degree intake. The Airpura 600 series has one of the highest air processing rates in the industry, however, noise level from the fan remains well below competitor's models with less air flow. Recommended Application: The Airpura UV600 is an excellent choice for homeowners seeking broad spectrum contaminant removal including not only airborne particulate and allergens; a wide range of chemicals, VOCs, odors; but also microbiological contaminants such as bacteria and viruses. It is a very popular choice for clinics and medical offices, baby nurseries, offices, nursing and assisted living homes, and other locations where extra protection from microbiological contaminants is required. Airpura UV600 is backed by an impressive manufacturer's 5 year parts replacement, and 10 year labor repair warranty. Note, warranty does not apply to UV lamp (10,000 hour life).